It’s time for a storage upgrade, but your budget won’t bear the burden of both a blazing new VelociRaptor hard drive and an extra injection of Kingston RAM. Decision time: if you’re looking to improve general performance on the cheap, do you shell out for more RAM or a high-performance hard disk? PCWorld Lab analyst Thomas Luong loves to take his work home, and this week he found himself causally running performance tests on his home machine (between dinner with the family and horsing around with his kids) just to see what happened. Thomas ran a full suite of performance tests using two different hard drive configurations, a Samsung 128GB SSD and a VelociRaptor 300GB, 10,000 RPM hard-disk drive. To make things a little more interesting he ran each test using two different RAM configurations, first with a 3GB setup and then with a hodgepodge of memory he found lying around on his desk that added up to 12GB. The results he brought in to work this morning were surprising, and not just because 9 a.m. is far too early to be writing about RAM configurations; if you take a look at his results, you’ll find almost no appreciable performance increase between this particular SSD and the super-fast VelociRaptor drive. However, the WorldBench 6 score for each drive setup jumped about 15 points after Thomas added a few sticks of extra RAM. If you’re not familiar with our testing methodology, that jump indicates roughly a 15 percent improvement in the performance of common consumer apps like Photoshop, Firefox, and WinZip. 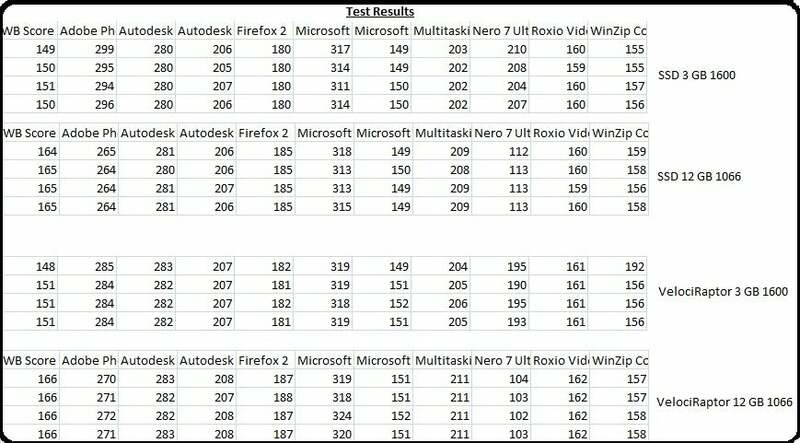 While programs that make heavy use of the hard drive (like Roxio’s VideoWave Movie Creator) may benefit from the faster read/write performance of a high-speed drive like the VelociRaptor, Thomas’ after-hours tests show that adding more RAM has the potential to shave your time spent on workday tasks (like video editing) in half. In the eternal battle between performance and price, upgrading your rig with 8GB of RAM is a far more worthwhile use of your $200 than trading up to a boutique high-speed drive like the 300GB VelociRaptor. The PCWorld Lab loves optimization, philly cheesteaks and long walks on the beach. Stalk us on Twitter @PCWorldLab for the latest updates on hot tech and cool tweaks! To see our results for yourself, click the link below!